I briefly suggested Lake Kenyir as a destination in my earlier post on Why You Shouldn’t Skip Kuala Terengganu if you happen to be travelling to one of the many beautiful islands off the coast of Terengganu in Malaysia. As mentioned in that post, Kenyir has long been a haven for anglers and is now actively being developed as an eco-tourism destination. But what does that even mean? What Kenyir really has to offer to visitors? Even I, as someone who hails from Kuala Terengganu, had the same questions myself so I would not blame you if you have the same thoughts as well. Hey! Great minds think alike, no? These questions were answered when I first went to Kenyir last year in April 2014 and again in June 2015 as part of the itinerary for the Terengganu International Squid Jigging Festivals. The following are the reasons why Lake Kenyir is fast becoming a must-visit eco-tourism destination, not only in Terengganu but also in Malaysia. In 2014, we hopped on a boat and went on a 7-hour island-hopping around the lake. When I first heard about it, I was like, “What? Island hopping in a lake?” but then I quickly remembered that Lake Kenyir is the largest man-made lake in South East Asia, about three times the size of Singapore, so yes, it IS big, so naturally there are plenty of islands around the lake. The interesting thing about each of these islands is that they’re being developed with their own unique attractions and eco-tourism activities so you won’t be left saying, “Oh no! Not another stop, all these islands look the same!” unless if you’re dead-set against eco-tourism so you can look forward to seeing and/or experiencing something new every time you get off the boat and hop onto the next island. There is an island that has been designated as a Bird Park, Butterfly Park, Tropical Park, Orchid Park, Herbal Park and probably the most popular one, Kelah Sanctuary, where you’d need to do some relatively easy trekking from the boat jetty to see and maybe swim with thousands of kelah fish (Malayan mahseer), an experience you’d probably never forget. I personally think that even though the island hopping trip took about 7 hours (from 10 a.m. to 5 p.m. including lunch break), it was still quite a rush. So perhaps it is advisable that you start earlier or skip a few islands if you prefer a more leisurely trip around the lake. If you’re more adventurous, you can also opt to go jungle trekking and head to one of the few waterfalls around the lake or explore mysterious caves like Bewah and Taat Caves. And then, of course, there is the new Kenyir Water Park that is located on Poh Island, just across the water from Pengkalan Gawi Jetty. While the water park might be relatively small (it has just completed its first phase of development at the time of visit in June 2015), there is no doubt that it would bring lots of fun and laughter among the youngsters in your party. This was certainly evident among the young visitors when I was there. 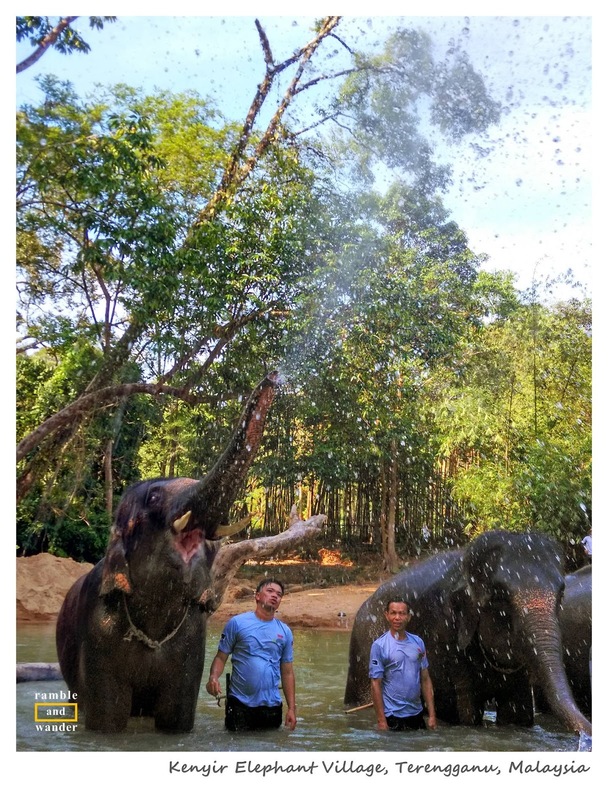 Kenyir Elephant Village, not far from the lake itself, was initially set up as a place to rehabilitate and protect wild elephants that became displaced due to developments around the Lake Kenyir area. It provides an opportunity for visitors to see elephants in “natural” and open enclosures outside of a zoo but still in a safe environment. While I personally do not recommend nor agree with the elephant show (where elephants young and old put on a performance to an audience) at KEV, I could still appreciate its other attractions and features like jambatan gantung (or canopy walk where you can walk around the area and see the elephants from above), the treehouses (which visitors could soon rent overnight) and the elephant bathing activities in the beautiful stream in KEV compound. In fact, I do believe these features are enough to pull in visitors to KEV even without the elephant show. Having a bath. And a laugh. Again, as briefly mentioned in my previous post on Kuala Terengganu, the above attractions could easily take one full day for you to complete, making it a great option for a day trip from Kuala Terengganu. A 2-day trip, however, would be more ideal. If you’d like to stay in the area, fret not, as there are plenty of resorts and rumah rakit (or boathouses) too for you to choose from. The latter probably is a great option if you’re an angler, and even if you’re not, I think it’d still be a pretty cool experience too. If you had asked me more than a year ago if I’d recommend Lake Kenyir to anyone, I’d probably say, “I’m not sure” or “I don’t know” but now I certainly would not hesitate to recommend it as one of the must-visit places in Terengganu. How about you? Have you been to Lake Kenyir before? What do you think of it? If you haven’t, would you consider it as part of your itinerary to Terengganu/Malaysia? 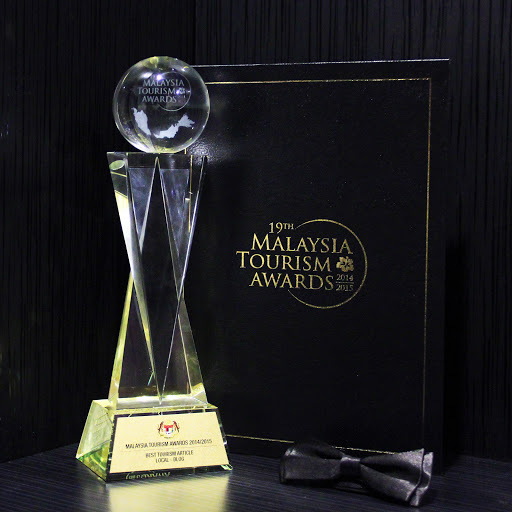 My appreciation and thanks go to Tourism Terengganu and Gaya Travel magazine for the opportunity to join Terengganu International Squid Jigging Festival 2015. Wow! What a comprehensive list! Thanks for the tips- will definitely check this out again when we head to Malaysia! I need to go back there again too. Would love to explore more and spend more time on each island and maybe try the boathouse too! Beautiful! I've been reading more and more about this area and its squid festival over the past two years. It definitely seems to be like a beautiful and interesting place to visit. Thanks, Jen. I love the place and the whole state but then again I might be biased as I'm originally from there, lol! But it's good to know that there are more awareness about the state & squid jigging festival - because that means the state tourism body is doing something right. Well... I started reading your blog post thinking "Oh yes, I like that, that sounds nice...", I looked at your photos and loved it even more and when I thought I'd love to spend a week there you mentioned those houseboats and I was ready to hop on a plane. I can't believe all of that is Malaysia. We overlooked it and I feel a bit bad about it, now I just want to go there and discover this country. This is a great post and good to see some happy looking elephants! Looks like a great place to spend some time. Thanks, Sophie. Yup, I'd love to go back there to explore more of the islands, doing some trekking and maybe stay overnight in a boathouse and in the tree house at the elephant village too. I want to go play in the water with elephants! I have never been to this part of the country. It sounds exhilarating. Thank for the amazing tips here! Yes, I enjoyed watching the elephants taking their bath, looked like they really enjoyed their time in the river. Have to be careful with your camera though, esp when the playful ones spray some water towards you. Great pics! I would love to go to that elephant park or swim with the kelah fish! Thanks, Kelsey! I definitely enjoyed my time at those two places and would love to go back there again soon! What an absolutely gorgeous place. Those orchids! Pinned! Ooh! I'm sure you'd love the Orchid Park at Lake Kenyir! Just imagine a small island practically covered with orchids! I wish I could have stayed there at the Orchid Park longer to take more photos! This sounds like such a fun time! I would absolutely love to hang out with the elephants in the water. If I"m ever in Malaysia (which could be soon), I'm going to look into doing this! I'm sure you wouldn't regret it! Do give me a buzz whenever you're heading this way! What a great post and beautiful collection of photos. They definitely induce wanderlust. Will definitely return to this post when I visit Malaysia! Thanks, Erika! Hopefully you'd come to visit soon! I'd love to see the Orchid Park since they're my favorite flowers! I can't believe a lake has so many great parks and destinations to visit. I'm also glad to see an organization that protects and rehabilitates wildlife. Hi I would love to know how do I enroll in the elephant tour?